Acute inflammation is a normal physical response to an injury or infection, but chronic inflammation is implicated in a large number of health complaints. Infection, stress, poor diet, and a lack of exercise can all increase the levels of inflammation in our bodies. Acupuncture and Chinese medicine, as well as lifestyle and dietary changes can reduce your inflammatory load, and help restore you to health and wellness. Inflammation is the body’s normal response to injury or infection. Your body might become red, swollen and painful at the site of the injury, signalling that your immune system has responded and is beginning the healing process. Short term inflammation is not usually a problem, but chronic inflammation indicates that something more serious is going on in your body. Chronic inflammation causes the thickening and scarring of connective tissue, and the destruction and death of bodily cells. It is thought to underlie a wide range of chronic diseases including cancer, allergies, arthritis, inflammatory bowel diseases, fibromyalgia, psoriasis and even depression. Scientific studies have confirmed that chronic stress leads to an increase in inflammation in the body (read the abstract here). A stressful event stimulates the sympathetic nervous system, priming the body to react to any perceived threat. This is also known as the ‘fight or flight’ response. Long-term activation of this response causes the body to produce higher levels of inflammatory cells, as well as lower levels of anti-inflammatory cells, causing chronic inflammation. Acupuncture and Chinese medicine have been used for centuries to treat many inflammatory disorders, but the mechanisms by which they work have not been widely studied. Acupuncture may work by switching off the sympathetic nervous system response to stress, decreasing inflammatory cells and allowing the body to remain in a resting, and healing state. A number of Chinese herbal medicines have been found to contain anti-inflammatory compounds. Diet and lifestyle changes are also important in decreasing our inflammatory load. Include lots of wholefoods in your diet including fruit, vegetables, grass-fed meats, fish, nuts and seeds. 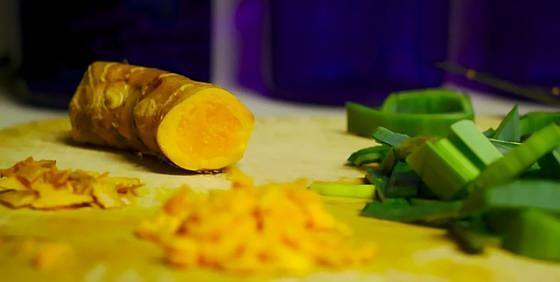 Ginger and turmeric are high in anti-inflammatory compounds – include these where you can. Low intensity exercise, stress reduction and getting a good nights sleep have all been shown to have positive effects on inflammation. Healing a chronic inflammatory condition can be slow and frustrating, but with time your body can heal itself. Acupuncture and Chinese medicine can decrease your body’s inflammatory response, calm your nervous system and promote healing.